Good for indoor and outdoor residential, high traffic and commercial purposes. A durable fibre, but less resilient. Polypropylene is the fastest growing fibre segment in use today. It is a relatively inexpensive fibre, which is easily extruded by most carpet manufacturers. Its strengths include superior stain resistance and low cost. Unlike other fibre types, polypropylene will not absorb water and must therefore be solution dyed (pigmented) to impart colour. Solution dyeing is a pigmentation process in which colour is actually built into the fibre when it is formed, or extruded, thereby becoming an inherent part that cannot be removed from the fibre. The colour is fade resistant, even when exposed to intense sunlight, bleaches, atmospheric contaminants, or other harsh chemicals or elements. However, since it is not as resilient as other fibres, polypropylene is normally used in loop pile constructions in which there is less need for superior resiliency. Polypropylene is widely known for it's durability and appearance and since it's dyed before it's made into a fibre, polypropylene is extremely colour fast. 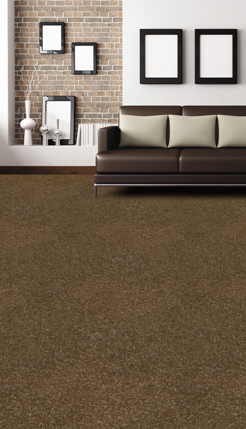 Talk to a Flooring Vision expert today for more information about our carpet choices.